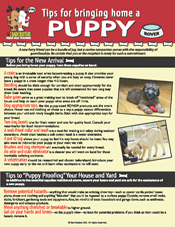 Toilet training for your puppy should start as soon as the puppy is home with you. You must be prepared to be patient and observant! after you return home from an outing. Many people take their puppies out for a walk only to see the puppies relieve themselves as soon as they get back indoors. To avoid this, walk the puppy to his toilet area. Stand still and stay with him, allowing the puppy to lose interest in you. Do not sit down as this will only encourage the pup to jump on you and forget what he is out there for. Praise him if he performs. NEVER rub his nose in any mistakes! Positive reinforcement when he does the right thing in the right place is the best and quickest training method. When training the puppy to go outside to relieve himself, LEAD him to where you want him to go, stay with him, praise him when he performs. Note that a male puppy sometimes takes longer to perform than a female.